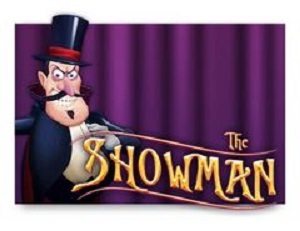 Abracadabra, Hocus Pocus and all that Jazz come join in the fun with The Showman Video Slot. The Showman is a 5 reel by 15 payline slot that offers some spectacular graphics and features. A really well thought out entertaining slot that should catch the eye of many. 1. Blue Birds of Happiness Scatter . Receive 2 to 5 Blue Birds of Happiness across your screen in any position and you will be rewarded with a handsome money value payout depending on the amount wagered. 2. 3 Bonus Spin symbols of Deborah the Assistant on reels 1, 2 and 3 will trigger the free spin feature. Click on each of the icons to reveal the number of free spins and multipliers you are being awarded. You can receive anything from 8 to 20 free spins with a multiplier of anything from x2 up to an amazing x5. A further spin is awarded for every Bonus Spin icon that appears during the feature. The multiplier shown at the start of the bonus feature applies to all win across all bonus spins. This also applies to any additional spins awarded. 3. The Magical Reappearing Reels – On certain spins the Magical will magically replicate the symbols on reel1 onto other reels. The number of reels it appears on is random and it can occur on any of the other reels. 4. Extra Wilds – On certain spins additional wild symbols will magically appear on the reels, increasing the chance of wilds landing in view and therefore increasing your chances of a winning combination. This rather refreshing little game is available to Slosmillion. Remember that Slotsmillion offer some awesome bonuses, so have a look around. Remember that there are always T&C’s that apply, so read them well. This entry was posted in Casino Blog and tagged The Showman Video Slot, The Showman Video Slot Review on September 11, 2018 by admin.